The United States is in the middle of a significant cultural shift. Until very recently, United States citizens and policy-makers were willing to accept, or at least tolerate, what has become our food status quo--a highly subsidized, centralized, industrial food system that is environmentally harmful and unsustainable and encourages unhealthy eating habits. Many citizens and policy-makers are now demanding that we re-evaluate our entire agricultural system from farm to table and look for ways to develop a new food paradigm that is environmentally sound, sustainable, socially equitable, and that makes healthy whole foods available to all. 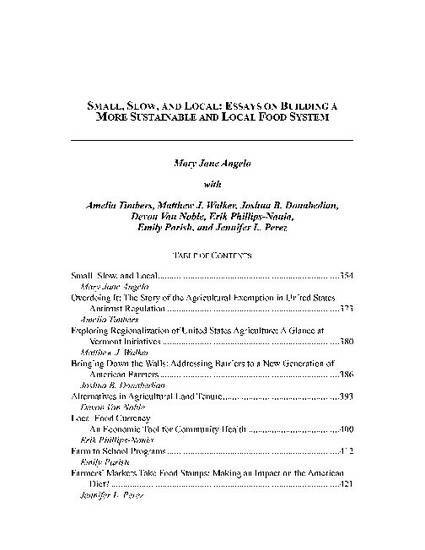 During the summer of 2010, I taught a course titled "Agricultural Policy and the Environment" at Vermont Law School. When I walked into the classroom on the first day I was shocked to see almost fifty students in the class. I taught the same course the year before and had approximately twenty-five students in the class. Although I cannot be sure, I think that if I taught the same course ten years ago I would be lucky to have enough students register to avoid having the course cancelled. Not only did the 2010 course have a very large enrollment, but the students who were in the course were extremely interested and engaged and brought with them a broad range of relevant experience. Some had grown up on farms in various parts of the country while others had chosen to work on organic farms as teenagers or adults. Some students had previously or were currently working on agricultural or food policy matters through a variety of organizations such as land trusts and in a variety of capacities such as being a social worker. Many others, while not having as much direct experience, had learned a great deal about agricultural and food policy through other formal education or independently. The widespread interest in agricultural issues at Vermont Law School mirrors the renewed interest in food policy by the public in general. Unquestionably, many factors contribute to this cultural shift to local foods, including a desire to feel more connected to the land and to interact more with our communities. However, certainly a major factor is the public's growing awareness that our current industrialized food system has failed us with regard to the health of both our diets and the environment.